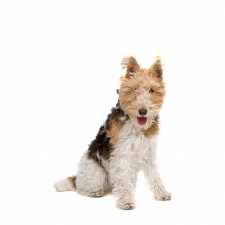 This breed is one of the oldest terrier type dogs, originating in the British Isles in the 17th century. They were bred to help get rid of animals that preyed on farmers stock, such as vermin, fox, and other small critters. The terrier would find the animal in the ground, start digging, barking, growling, and lunging until the animal came out of its den where the hunter or farmer would then kill it. While breeders didn’t keep many records, it is thought that the Fox Terrier was developed by crossing ancient Dachshunds, English Hounds, Bull Terriers, Greyhounds, and Beagles. For many years, Smooths and Wires were considered one breed but of two different varieties; their main difference being their coat type and head shape. They have been separated in the United States since 1984, each having their own separate breed standards. This is a high-energy dog! They have the trademark terrier temperament in that they are fearless, inquisitive, energetic, bossy, feisty and playful. They are alert, lively, and smart. They’re also prone to mischief, but in such a charming manner! They need at least an hour of exercise every day to help keep them from destructive behavior. These dogs are also highly intelligent and trainable. Always keep a Wire Fox Terrier on its leash when out as they are known for their love of running and may possible run away. They also have a high prey drive and will chase cats and other small animals. Wire Fox Terriers are not naturally well-behaved dogs, so you will definitely need to get an early handle on training these little guys. They make excellent watchdogs, but some can be nuisance barkers. Some Wire Fox Terriers to do well with other dogs and with children, and some do not. This is a breed that requires a lot of attention and training but when they get it, the rewards are well worth it as they are friendly, loyal, affectionate, and have a zest for life. In fact, these dogs were bred for stamina and their never-ending energy will remain with them throughout most of their lives. Wire Fox Terriers usually weigh between 15 to 19 pounds and stand approximately 14 to 15.5 inches tall. They are a small dog with a sturdy build. Their coat is hard and wiry, and their color is usually predominately white with liver, brindle or red coloring. The Wire Fox Terrier’s dapper appearance attracts attention wherever they go; in fact, they are stars in the show ring, winning more awards than any other breed. Caesar, a Wire Fox Terrier, was beloved to King Edward VII. On his collar was inscribed the words, “I am Caesar. I belong to the King.” When King Edward died in 1910, a grieving Caesar followed behind his casket in the funeral procession. In the 1920’s, a Smooth Fox Terrier named Nipper became of the most recognized dogs when RCA used it in its logo.